The T/C Triumph Bone Collector, the signature gun from T/C Pro Michael Waddell who helped design this revolutionary firearm. As one of a kind, exclusive gun that has all the great features of the Triumph but improves upon them by adding Flex Tech technology and Energy Burners to a shorter stock (approx. 1"). Also, added is T/C's premium fluted barrel with Weather Shield and T/C's patented Power Rod. This .50 caliber powerhouse has a composite stock in Realtree AP camo/ Weather Shield. 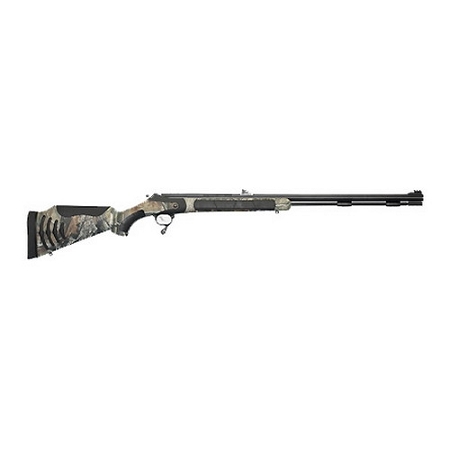 The Triumph Bone Collector is the most performance driven and innovative magnum muzzleloader on the market today. Wherever your adventures may take you, the Triumph Bone Collector will be there to help you take your next trophy.